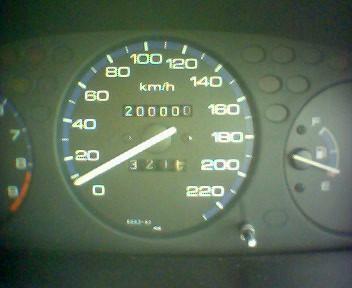 My car has reached it's 200,000 of mileage, in kilometer. That means that my car would need a timing belt change, and certain redos, maybe the hydraulic part of the head which has caused some noise and may contribute to a lagging in picking up. While celebrating it's 200,000 km in mileage, when i was driving back from charles office in pasir gudang, a plywood suddenly flies off and hits my bumper. Luckily it just hit my bumper, not my windscreen or other things. Now, maybe it's time to change to the '99 spec, as I've always been dreaming of. Been looking around for the bumper replacement. I even called my cousin, Abg Man to look for a replacement in KL but in seems that noplace (as in nobody) have it. Tomorrow I'm going up to KL. Will be going to have a berbuka puasa with Farhan's mother in Seremban 2, then only I will drive off to kl the next morning. Staying one night in Senawang may give me a lil bit of time to do something on the Net. Life is rather boring without being online nowadays. I need to refresh a lotsa things. I need to change a lil bit of my life heading. Falto realmente a alguien. He faltado ella para tan largo. Sé que no podría conseguirle el anymire del amor sino confiarme en, mi corazón perteneceré siempre a ella. La amo tanto, más que cualquier cosa que tenía.